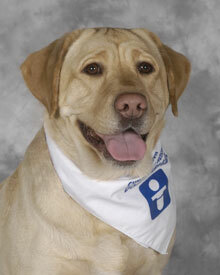 Labrador Retriever Bella has been with the Doggie Brigade since 2007. Her favorite treats are chicken strips. Those big brown eyes. That joyful glaze. Dogs bring smiles wherever they go. That’s why they come to Akron Children’s Hospital. Since 1992, the Doggie Brigade has brought joy, comfort and sloppy kisses to sick kids. Each week, our child life staff generates a list of patients whose doctors have approved a dog visit. The dogs must receive approval status to join the Brigade with the other volunteers. All dogs undergo a veterinary exam and a behavioral screening process to ensure their suitability for the program. Once accepted, they receive their official Brigade bandanas that all of our volunteer dogs wear. Bring on the smiles. Have you or your child ever had a visit from our furry friends? If so, please share your story. Find out what else makes us Uniquely Akron Children’s.